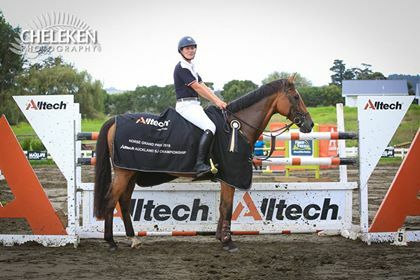 Elmo Jackson has been knocking on the door of victory with his Australian import Dr Feel Good for a while, and finally today, it all came together at the Auckland Alltech Show Jumping Championships with a win in the Dunstan Horsefeeds and EquiFibre Horse Grand Prix. Eighteen-year-old Jackson has had the horse nigh on a year. 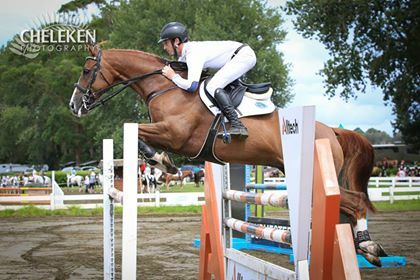 Last weekend they were second in the Grand Prix at Brookby, but this weekend, they claimed it with the only clear in the opening round. 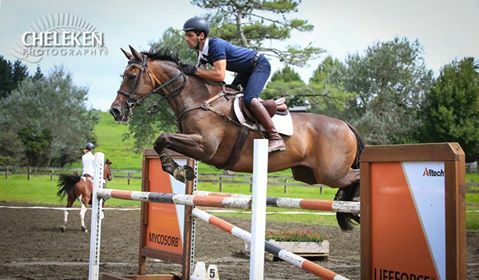 He and the 11-year-old warmblood were eighth to go in the 10-strong field at Woodhill Sands today and he says winning was the furthest thing from his mind. He’s looking forward to HOY where he will start in the 1.4m and the Norwood Gold Cup and then “play the rest by ear”. Jackson has just finished school and after the Horse of the Year Show will be heading to the UK to ride thanks to a contact from his trainer John Cottle. Finishing second to him today was current Olympic Cup holder, Lily Tootill (Karaka) and Ulysses NZPH who were the fastest of the four-faulters, with William Willis (Auckland) and Dollar Roll MS third and Nakeysha Lammers (Taranaki) aboard Resolution in fourth place. 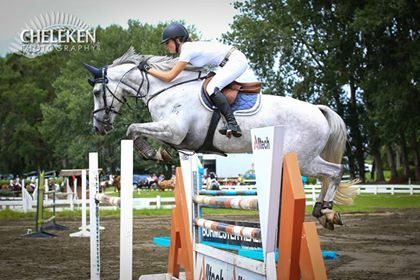 Competition was tight for the minor placings in the Country TV Pony Grand Prix where Emma Watson (Morrinsville) and Maddox Funhouse notched the only clear of the 13 starters in the opening round over the Pip Howells-designed course. 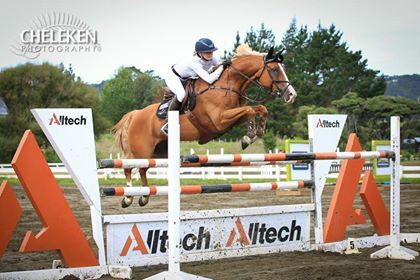 Second placed Maddison Greatorex (Waipu) and Spotified were clear but had a single time fault, while a blanket covered the rest. Cyclone Gita saw only 270 horses start on the first day of the championships, but by Sunday, with clear skies, there were 400 entered. It is the first year the show has introduced some new cup and plate classes for the lower levels in both the horse and pony divisions. Dunstan Horsefeeds and EquiFibre Horse Grand Prix: Elmo Jackson (Auckland) Dr Feel Good 1, Lily Tootill (Karaka) Ulysses NZPH 2, William Willis (Auckland) Dollar Roll MS 3, Nakeysha Lammers (Taranaki) Resolution 4, Nicola Hammond (Cambridge) Carol I 5, Emily Hayward (Te Awamutu) Belischi HM 6. 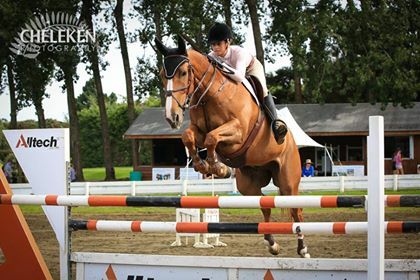 Country TV Pony Grand Prix: Emma Watson (Morrinsville) Maddox Funhouse 1, Maddison Greatorex (Waipu) Spotified 2, Katie Readings (Taukau) Circus Girl 3, Jayden Horsfall (Kerikeri) My Dreamcatcher 4, Rylee Sheehan (Te Aroha) Tony the Pony 5, Keira Page (Waiheke Island) Redcliffs Colour Me In 6. Purepine Shavings Seven-Year-Old series: Nakeysha Lammers (Taranaki) Balboa NZPH, William Willis (Auckland) Sabine MS 2, Victoria Rattray (Mangatangi) Larmani MVNZ 3, Abby Robinson (Ohaupo) Hillman Hunter 4, Ally Carson (Putaruru) Letano 5, Samantha Felton (Matangi) Ricker Ridge Sooty GNZ 6. Mitavite Six-Year-Old Series: Rosie Commons (Auckland) Lotte 1. East Coast Performance Horses Five-Year-Old Series: Paula Mussen (Pukekohe) Deja Vu NZPH and Jeremy Whale (Cambridge) Dolche NZPH =1. FMG Young Rider Series: Emily Hayward (Te Awamutu) Belischi HM 1, Lily Tootill (Karaka) Ulysses NZPH 2, Olivia Dalton (Karaka) Appleton 3, Oliver Croucher (Rotorua) KPH Stow Away 4, Nakeysha Lammers (Taranaki) Resolution 5, Bryony Smith (Waimauku) Ngahiwi Warrior 6. 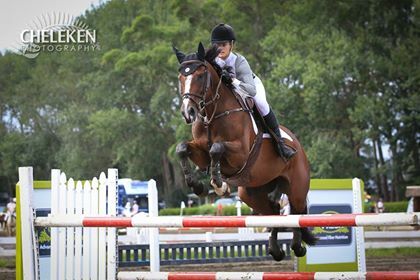 Dunstan Horsefeeds & EquiFibre Pro Am Rider Series: Alexa Randall (Auckland) Louis 1, India Causebrook (Pukekohe) Westminster Rock 2, Abby Robinson (Ohaupo) Hillman Hunter 3, Edward Bullock (Waiuku) Weiti Danneverke 4, Karen Riddle (Rotorua) LC Telepathy 5, Joanna Bullock (Warkworth) Weiti Justice 6. Caledonian Holdings Amateur Rider Series: Tim Featherstone (Northland) Kiwi Supakee 1, Paige Orlandini (Waitemata) Phoenician Gifted 2, Andrea Kewish (Waikato) Spring Fling 3, Jane Burmester (Waitemata) Corpus K 4, Catherine Fawcett-McNaughton (Auckland) Golden Girl MVNZ 5, Kimberley Knight (Waitemata) Louis Lamont 6. Dunstan Horsefeeds and EquiFibre Junior Rider Series: Olivia Dalton (Karaka) Bling du Rouet 1, Siobhan Waters (Auckland) Coronella 2, Deanna Horsburgh (Cambridge) Ngahiwi Possum 3, Emelia Forsyth (Auckland) Henton Serenade 4, Caira Manson (Auckland) Waitangi Attachment 5, Maddison Bult (Kumeu) Don Perignon II 6. Prydes Easi Feed Pony Welcome Stakes 1.15m: Emma Watson (Morrinsville) Maddox Funhouse 1, Keira Page (Waiheke Island) Redcliffs Colour Me In 2, Keira Page (Waiheke Island) Redcliffs Kodak Moment 3, Natalia Lammers (Hikurangi) Airbourne Magic 4, Jayden Horsfall (Kerikeri) My Dreamcatcher 5, Isabelle Jameson (Whangarei) Pico Boo 6. Fiber Fresh Feeds Horse GP Super Series FINAL: Emily Hayward (Te Awamutu) Yandoo Lady Gold 1, Jeremy Whale (Cambridge) DSE Exuberance 2, Alexa Randall (Auckland) LC Tango 3, Rosie Commons (Auckland) Athena GNZ 4, Elmo Jackson (Auckland) Sugarman 5, Christine Cornege (Cambridge) Varekai SL 6. 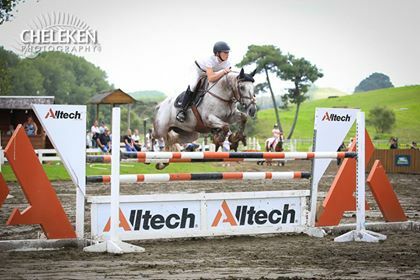 Alltech Horse Welcome Stakes: Emma Watson (Morrinsville) Maddox Silverkee 1, Renee Faulkner (Papakura) Rubinstar HH 2, Jeremy Whale (Cambridge) Caprio 3, Olivia Newsom (Tauranga) Showtym Cadet MVNZ 4, Alannah Jackson (Cambridge) Airthrey Resolution 5, James Cottle (Auckland) Oracle WT 6. Fiber Fresh Auckland Championship Horse 1.35m: James Jackson (Ngaruawahia) Coco 1, Alexa Randall (Auckland) LC Tango 2, Shelley Ross (Auckland) Onward 3, Jeremy Whale (Cambridge) Caprio 4, Becky Harkess (Cambridge) CoDicea 5, Kate Hewlett (Kerikeri) Capatino GNZ 6. Prydes EasiFeed Pony 1m Auckland Cup: Ella de Leeuw (Hamilton) Just Nuts 1, Emma Watson (Morrinsville) My Infinity 2, Lucas Bremner (Whangarei) Triple Star Picture Me Now 3, Charli Forsyth (Paeroa) Rapido Zin Zan 4, Isobel Faber (Waihi) My Emoji 5, Harrison Sterling (Wellsford) Tazz 6. Prydes EasiFeed Pony 1m Auckland Plate: Imogen Wright (Auckland) McCartney 1, Aoife Brennan (Waikato) Marmalade 2, Isabelle Jameson (Northland) Weiti Be Unique 3, Natasha Forsyth (Waikato) HS Bank on Me 4, Samantha-Lee Wakeling (Waitemata) BMW Sweet Chilli 5, Harrison Sterling (Auckland) Tallyho Mozart 6. Collinson FX Horse 1.1m Auckland Cup: Chloe van den Boorn (Waitemata) Mirrabella Piper 1, Keeva McCambridge (Waitemata) Hey There Delilah HH 2, Daniel Blundell (Auckland) Remi Wordly Prince 3, Nicola Smith (Cambridge) Verdant Blue NZPH 4, Craig Sullivan (Waitemata) Weiti Ontario 5, Kylie Thompson (Auckland) Whistler 6. Saddlery Warehouse Horse 1.1m Auckland Plate: Laoise McCarthy (Omokoroa) Cosmic Cowboy 1, Lily Tootill (Karaka) Vallure 2, Alexa Randall (Auckland) Conquest 3, Catherine Fawcett-McNaughton (Pukekohe) Golden Girl MVNZ 4, Karen Riddle (Rotorua) Wickcliffe Valenka 5, Louise Gilmore (Te Awamutu) Aratoro Melodia 6. Equissage Horse 1.05m Championship: Rochelle Litherland (Whitianga) Indigo Sunrise 1, Emily Carter (Pukekohe) Pretty Wicked 2, Baylee Wooldridge (Whitianga) Bellevue Boy 3, Joanna Bullock (Warkworth) Weiti Chevrolet 4, Jiu Kimura (Cambridge) Envious 5, Sarah Revis (Auckland) Dance Elite 6.